Many reports about marijuana or cannabis these days are positive because a few States in the US have ‘legalised’ the use of cannabis mainly for medical and industrial uses. There are many documented risks with cannabis, as with any drug. However an interesting outcome of using marijuana appeared to evolve out of a study published in JAMA Psychiatry. It found that the risk of periodontal disease may be increased with long-term marijuana use. The co-author of the study analysed the data of 1,037 adults from Dunedin New Zealand. Subjects in the study were born in New Zealand in 1972-1973 and were followed up from birth until the age of 38 years. They underwent regular health and lifestyle assessments during follow-up. The study was a broad one looking at the use of marijuana and its affects on their physical health and the specifically at whether marijuana use affected later-life periodontal health and other conditions. Compared with subjects who did not use marijuana, it was found that persistent marijuana use for up to 20 years was associated with greater risk of periodontal disease by the age of 38. Remarkably though, when the study focussed on other later-life physical health problems, long-term marijuana users were found to be at no greater risk than non-users of the drug. The authors of the study say that their findings showed that cannabis use over 20 years was unrelated to health problems in early midlife. Across several domains of health (periodontal health, lung function, systemic inflammation, and metabolic health), clear evidence of an adverse association with cannabis use was apparent for only one domain, namely, periodontal health. It may be that the element of cannabis in the study is simply related to the known risk of smoking regular tobacco. 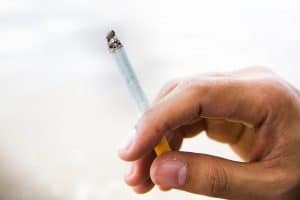 There is an abundance of scientific evidence that smoking has an additive effect on the progression of periodontal disease and is detrimental to healing after periodontal therapy. However it is clear that smoking anything increases the risk of periodontal disease. We have dealt with many cases where periodontal disease has gone undiagnosed or untreated for many years. Your general dental practitioner should be checking for the disease at every routine appointment and if there is a suspicion that the disease is starting to take hold then appropriate treatment should be recommended. Once the disease is diagnosed then there is no cure. With treatment it is possible to halt the progression of the disease. If you have recently been told for the first time that you have advanced periodontal disease then please call us. Your previous dentist may have been negligent and may be responsible for your future treatment costs. These costs could run into thousands of pounds.